I seem to have unintentionally crafted a bright, colorful birthday for myself. That I’m posting these two objects on my birthday is perhaps the most serendipitous part — although, maybe not. I seem to be scrimping on the photographs today in order to get something posted. Please forgive me. The addition of color is quite welcome, though, because it seems to me January has been quite grey. Many days without sunshine. When this pattern was first published (in September, maybe? ), it was one of those (it happens only rarely for me) patterns that grab a person and won’t let go. I *had* to make this, immediately! Except, the immediacy was delayed, since I needed specific yarn that I didn’t have and couldn’t quite justify buying. This photo is of the shawl before blocking. It has been blocked now, but I don’t have a decent photo of it yet. I used Marks & Kattens Fame Trend. More details on my Ravelry project page. I love how colorful it is! Then. 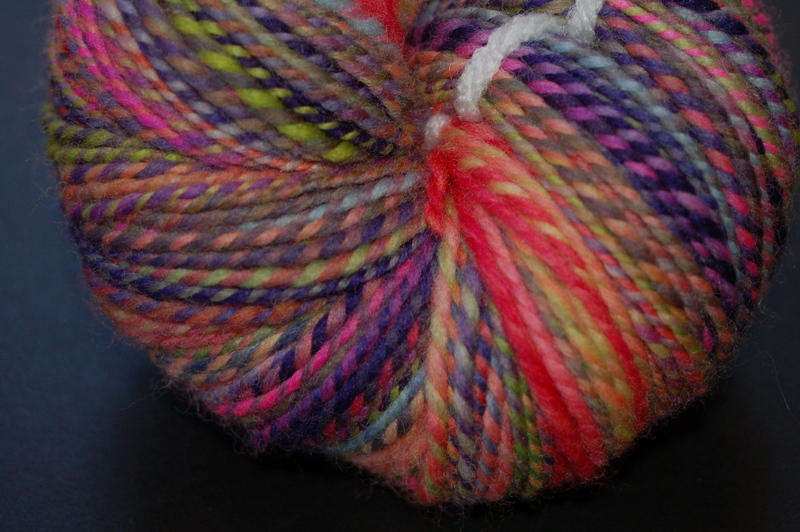 Remember this yarn (merino, two-ply, my handspun; dyed by me last summer at the fiber festival in Iowa)? I cast on Monday using this Wendy Knits pattern, and on Thursday I cast off, on the second sock. Again, more details on my project page. I think maybe it’s time to put some color on. This entry was posted in knitting, WordLily and tagged fiber arts, fiber arts friday, finished object friday, handspun. Bookmark the permalink. Happy birthday! I love your beautiful projects! Happy Birthday!!!!! Love the socks!!! Thanks. I’m really happy with them. Motley’s is one that I would love to knit some day myself. Yours turned out great. Happy birthday! Happy Birthday Hannah! I love the colors in the shawl and the socks! Whoa, awesome color! Happy Birthday to you, I hope it’s wonderful. Thanks for sharing such bright colors on this post-snowmagedden Friday. Wow! I can’t wait to see that shawl blocked. It’s bright colors are beautiful. 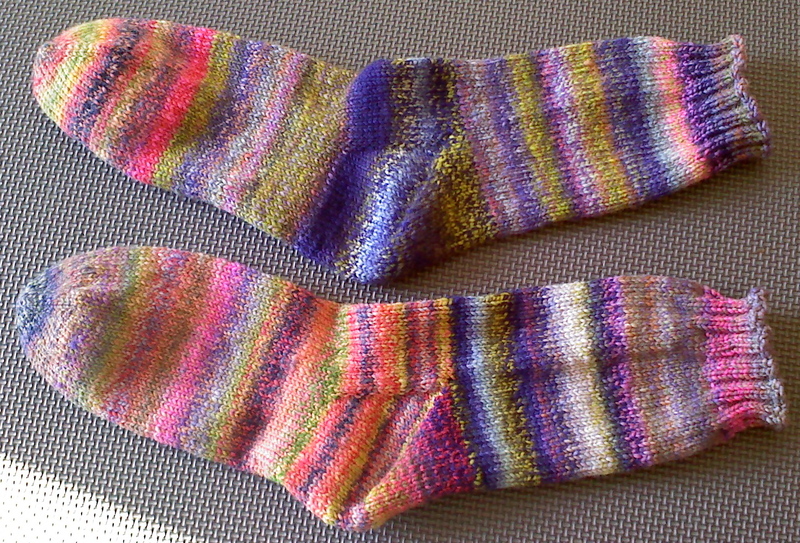 Your handspun and the socks you created from the yarn are rock star! I am just now starting to knit with my handspun and it is so addictive and rewarding. Happy Birthday! I hope it continues to be colorful and fun! Oh, I totally agree. Whenever I knit with my handspun I wonder why I ever use anything else! HAPPY BIRTHDAY!!!!!!!!!!! Your projects are beautiful and are great gifts for yourself! I love the colors and can’t believe how quickly you finish those socks! WOW! It’s by far the fastest I’ve ever finished a pair of socks, believe me. I was shocked by how quick they went, too! Wow! Your Motley has blown me away! I think your looks even nicer that the original pattern pictures. Truly amazing and a very welcome jolt of colour in my day. Aw, thanks! I’m quite smitten with both of these projects. I love the (shawl?) Motley thingy. It’s so fabulous. The colors and everything. You did a great job. Thanks for sharing! That shawl is a work of art, I want to hang it up on my wall. Such beautiful colours and fascinating texture. I understand completely why the pattern grabbed you like that! Aw, thanks. I can’t relegate that shawl to the wall, though; it begs to be worn! Happy birthday! Two beautiful projects! I especially love your handspun socks. That’s such a beautiful shawl! So colorful, I just love the colors you picked.